Bean Soup made from leftovers! 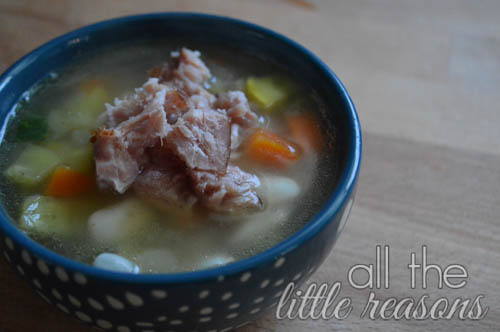 As I think about Easter and hams and leftovers, my mind drifts to a delicious bean soup. I thought I’d post this one in preparation for the season! I actually buy the spiral sliced ham bones from the deli at our local Heinens grocery store. They are under $5, make a huge pot of soup, and usually have plenty of meat left on them. Start by making stock with your ham bone. Follow the directions here. 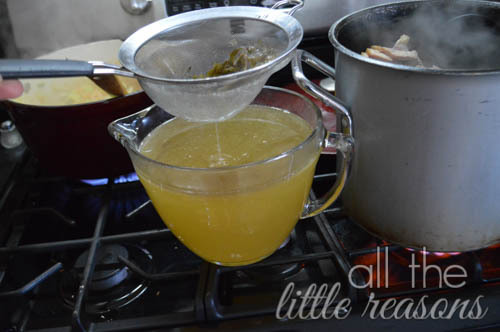 It’s for turkey stock, but I do it exactly the same whether it’s chicken or turkey or ham. Throw the onion and celery tops into the pot with water and the ham bone and cook it down! When that’s almost done cooking down, sauté onions, celery and carrots in your soup pot. At this point you can also add any other veggies you think would taste good. I put a small zucchini and a small yellow squash. Strain the stock and add 12 cups to the pot with the sautéed veggies. 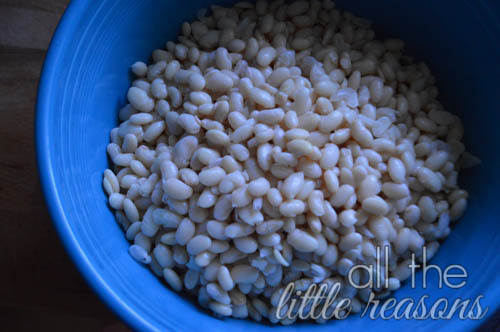 Add 4 cups of white beans — or about 2-3 cans of drained, rinsed white beans. I almost always cook mine from dry. While it is a little cheaper, the biggest reason is because of the ridiculous amount of sodium in canned beans. It really is crazy! That’s one reason to rinse the canned beans really well before you use them. It helps to get some of that added sodium out. 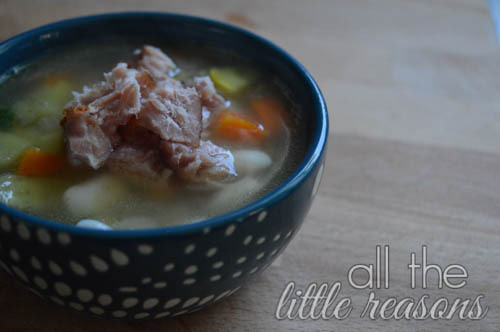 Take the ham off the bone that is leftover and add it to the soup. At this point, taste the soup. Most likely it will need salt. I don’t mind adding my own salt to things because I use himalayan sea salt, which doesn’t have all the minerals stripped out of it. So salt it to taste and enjoy! My kids couldn’t believe how yummy this soup was…and once you have the stock made, it only takes about 15 minutes to throw it together! Another super easy meal to add to your mix. Oftentimes, I make the stock one day when I’m home in the evening and strain it and store it in mason jars in the freezer (please make sure you leave enough head room for expansion!) Then you can just grab the jars out of the freezer for an easy soup down the road. Or don’t freeze it and just have it ready for this fast soup a few days later. Enjoy! 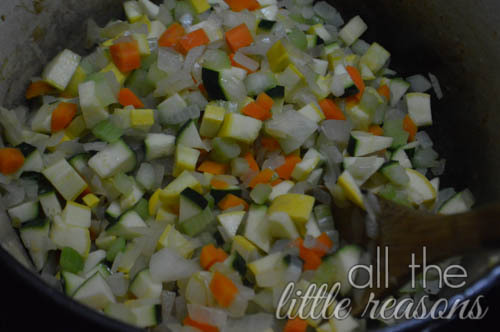 Sautee onion, carrots, celery, zucchini and yellow squash. take ham off bone and add to soup. Joelle, if you are not using canned beans do you cook them ahead in a larger quantity to have them ready to use when you need or cook them earlier in the day? How long will it take to cook the beans from dry? I know you are so good about cooking things in larger amounts to have on hand to make quick, healthy meals. Could you tell us sometime the things you DO make ahead to keep in the fridge for quickie meals, please? thanks!! Deli section. They sell ham off the bone at our Heinens. I did serve it with cornbread, of course!